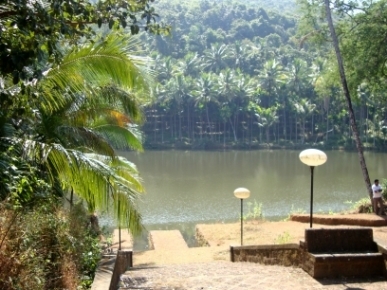 Keri is about 30 km from Panaji, the capital city of Goa. 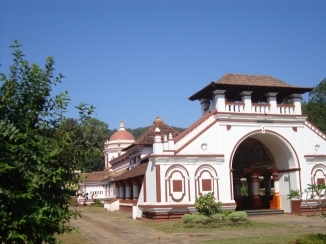 Shri Vijayadurga Temple, built in 1560, is located at Keri in North Goa District of Goa. Distance of various important cities of Goa. karamali Railway station 22 kms. Ponda bus stand 9 kms. Public bus transport is available from Ponda bus stand on weekdays at an interval of 1 hour from 8 0'clock in the morning till 7.00p.m. in the evening. 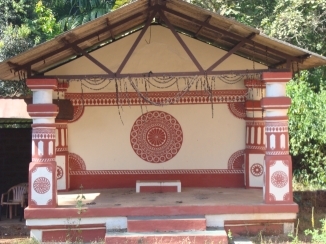 One has to board a bus going to Savoi-verem or volvoi from Ponda bus stand and get down at shri Maruti Temple stop at Keri.The temple is at a distance of 500 mtrs from the bus stop.Taxi and rickshaw services are also available from Ponda city. 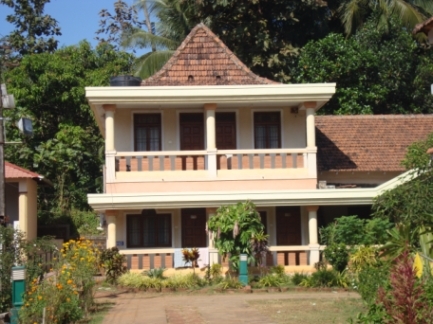 Accomodation & boarding facilities are available with advance intimation and subject to availability.During festival periods it is difficult to get rooms without advance bookings. During other days ,rooms are normally available for stay. A scheme named as ANNADAN YOJANA was launched in the year 2001 whereby food/prasad is made available to the visitors from breakfast in the morning till dinner at night.The scheme is continuously in operation for all the days of the year. 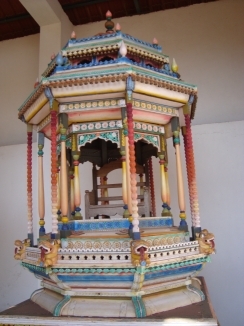 There are no charges to be paid for this facility but devotees can make voluntary contributions which can be deposited in the donation box placed in the dining hall.Donations for annadan Yojana are also accepted at Devasthan office. 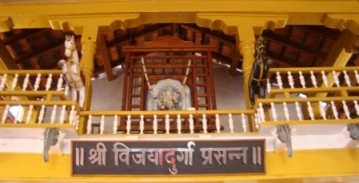 It was once said that when the war going between Vishnu and Shiva was stopped by Shri Shantadurga when she took Vishnu and Shiva by her left and right hand, and according to the Skandapurana it is said that how Lord Shiva, when defeated by his spouse Parvati in a game of dice, had left mount Kailash and gone to Gomanchala near Kushasthali for tapasya (penance). 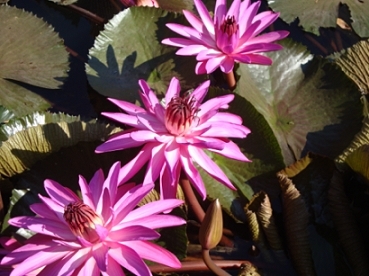 It is here that he heard the cries of the Brahmin, Loma Sharma, caught by a crocodile in the river Aghanashini. When Shiva saved Loma Sharma, he prayed to the Lord to remain in Kushasthali. Similarly, when Parvati arrived looking for Shiva, she was also requested to stay at the nearby village of Keloshi (Kadalivana Quelossim). 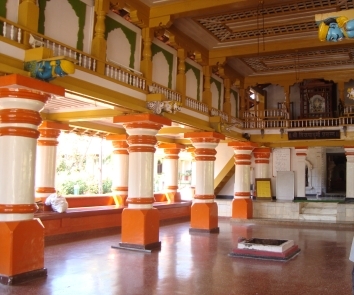 This shrine of Shri Shantadurga Devi is Situated to the present day location, Kavlem and is often known as Kavlem Shantadurga. 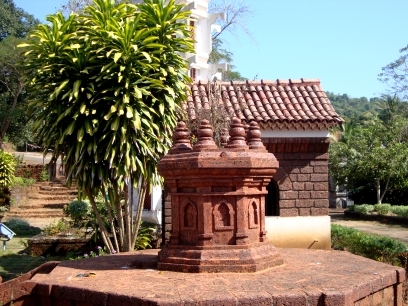 The Shantadurga of Kavlem was then said to have gone to Shankwali to kill the demons harassing the Brahmins there. 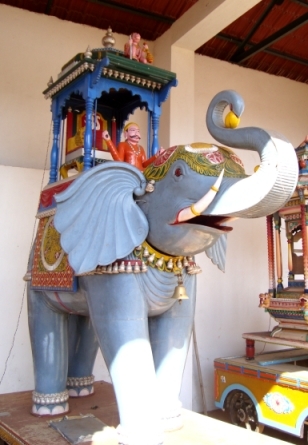 This arrival of Shri Shantadurga in her aggressive form is worshipped in the present day Gothana - Ponda, Goa. 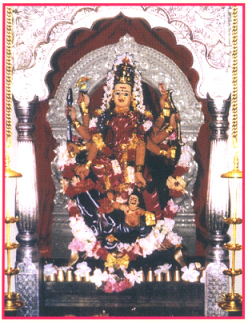 When she destroyed all the demons in Sankhwali, she earned the name of Vijaya and hence from Shantadurga she was given the name as Vijayadurga. 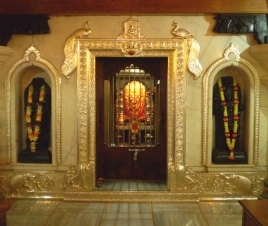 The mahajans are either Gauda saraswat bramhins or Dravid/Karahde bramhins.In the case of gauda saraswats, they are mahajans of Shri Shantadurga & Shri Laxminarasinha of Gothan Veling(a place situated at a distance of 6kms from Keri). However in the case of Dravid /karhade bramhins , they are mahajans of Shri Vijayadurga only. 7.00 a.m. to 7.30 a.m.
8.30 a.m. to 9.30 a.m.
A.C. Room:Rs 500/- per day. Non-A.C. Room(attached):Rs 200/- per day. Non-A.C. room (Non -attached):Rs150/-per day.